Telecom industry veteran to lead sustained growth in the region. Nick Applegarth has joined CosmoCom's executive management team as vice president for Europe, the Middle East, and Asia (EMEA). 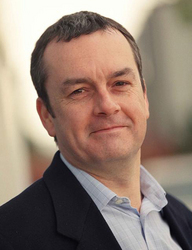 With nearly 25 years experience in the telecommunications industry and a diverse background that includes senior general management, sales and marketing across international boundaries, particularly EMEA, Applegarth is poised to build upon CosmoCom's legacy of success in the region and lead his team to accelerated growth. "Nick has a tremendous track record of sales achievement in EMEA. He understands both the Telco and the enterprise sides of our business and brings in-depth experience in both channel and direct selling models. He will add great strength and bring new thinking and fresh insight to both the EMEA region and the company as a whole," said Ben Eisner, CosmoCom President and Chief Operating Officer. Prior to joining CosmoCom, Applegarth was senior vice president and general manager of EMEA at Envox, a company specializing in interactive voice response software platforms and call center and communications solutions. Before that he was managing director at Nuance Communications. He spent the better part of the 1990s in successful sales and management positions at voicemail giant Octel, which was acquired by Lucent, where he assumed the role of vice president of service provider messaging for EMEA. Earlier in his career he worked for other players in the communications industry, and brings a good blend of large company discipline with small company creativity and flexibility. "I have been watching CosmoCom for a long time and am very pleased to be joining CosmoCom at this point in the company's history," stated Applegarth. Citing the growing demand for virtual contact centers throughout Europe, he said , "I feel confident that the time is right for CosmoCom to expand upon our achievements in the region and seize the opportunities that await our superior technology. CosmoCom is already positioned at the forefront of the IP contact center space, and I'm excited and delighted for the chance to contribute to its ever growing success in EMEA and beyond." "We are very pleased that a telecom executive of Nick's caliber has decided to join CosmoCom," said Ari Sonesh, CosmoCom's CEO. CosmoCom's success in the EMEA region, especially with providers of hosted contact center services, is well known. With the addition of Nick Applegarth to our management team, I feel certain that CosmoCom will continue to make great strides throughout Europe. Nick has hit the ground running, and we welcome him with encouragement and enthusiastic support." Nick will be managing the region from the U.K. office, which recently moved to a new location in an 18th-century manor house in Leatherhead, Surrey to support the growth in the U.K. market. He is fluent in French and Russian, and conversant in Spanish, Italian and German.